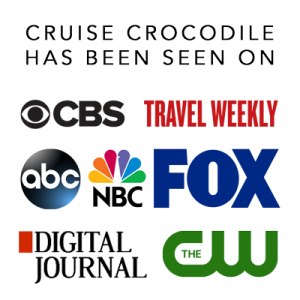 Our Ashdod cruise port guide gives you information about the docking location, cruise dock, transportation options and much more! Welcome to the Ashdod cruise port guide. Ashdod is a city known for its harbor. At the moment it has 210.000 inhabitants and it is also known as one of the city’s in Israel with the biggest growth. It is a city with a very long history, although there are only a few monuments and buildings left that tell us about that history. The port where you will dock is the 2nd largest harbor in Israel. Haifa being the largest. From this port they ship the chemicals from the Dead Sea area and also export the famous Jaffa oranges. Ashdod is a modern city, with a nice marina and waterfront for a stroll. It is good for shopping, but that is about it. Make sure you are not missing out and go further afield. Without a doubt the highlight to visit would be Jerusalem. This is just over a 1 hour drive and can be visited in different ways. Exploring Jerusalem is a unique experience and one you simply cannot miss. One day is not enough so therefore a 2nd or 3rd visit to this city will even be worth it. It is such an inspiring place no matter what religion you follow. There are so many pilgrim sights, church towers, monastry’s, mosque’s and synogogs all over the city and this is what makes it basicaly one gigantic open air museum. For the Muslims the city is sacred because according to them this is the place where profit Mohammed went to heaven. For the Christians the city is sacred because it was here that Jezus of Nazareth was crucified. In Judaism Jerusalem has been the holiest city in Judaism and the ancestral and spiritual homeland of the Jewish people. Whatever religion is yours and whatever your believes are, everybody will agree something absolutely unique has happened here over time. You literally step into the footsteps of the most sacred figures in history. The port of Ashdod is a big container harbor. It is different for every cruise line, so make sure to double check the immigration requirements with your cruise line, but you can expect a face to face immigration process in the terminal. It is prohibited to walk in the port. Therefore you can only leave the harbor by tourbus, shuttle bus or taxi. The port is about 5 km away from the city centre of Ashdod. Taxis in Ashdod Taxis are generally available in the port. 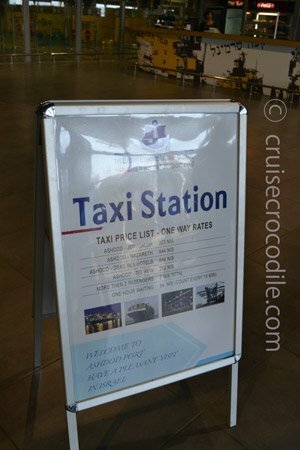 In the terminal you’ll see a taxi station sign like the one on the lefthand picture. Based on this you can calculate how much a private taxi tour for you should cost. Shuttle bus Walking in the port of Ashdod is prohibited. 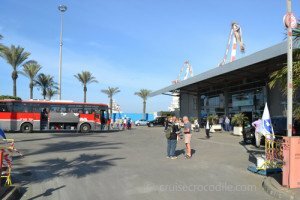 Most cruise lines will offer a shuttle service into the town of Ashdod. Mostly this shuttle bus will go to the Sea Mall. Double check this information with the front desk on board. This is a convenient location to start a trip through Ashdod or to go further afield. If your ship doesn’t provide a shuttle bus check with your ship if the port provides a shuttle. This one usually takes you to the exit of the port. Public bus system There is a public bus system in Ashdod that is suitable to get you further afield. There is no public transportation at the port (just at the exit of the port). You will need to catch the shuttle bus into Ashdod. If your shuttle bus takes you to the Sea Mall the public bus station is located right next to the mall. Buses to Jerusalem depart from here. If the shuttle bus stops at the exit of the port than take bus nr 2 or a taxi here to take you to the bus station. Jerusalem: Take bus 438 and 448 to Jerusalem. It only departs every 2 hours so please check the schedule in advance on: http://mslworld.egged.co.il/?language=en&state=2#/search. The bus takes about 1,5 hours and it leaves you 3 km from the old city of Jerusalem. From here bus 8, 25 and 32 are going to the old city. The bus ticket of approximately 20 ILS will have to be paid in Shekel. Bethlehem: There is no direct bus from Ashdod to Bethlehem, first go to Jerusalem and find transportation there. Remember that there is a checkpoint you have to cross. – Is there a chance the ship doesn’t go to Israel? Always, there is never a guarantee the ship is able to go although they will do their very best. – Is it safe in Israel? Generally the areas that you will visit are safe. If it wouldn’t be, the ship wouldn’t go there. – Is it better to go with an excursion? If you do go without excursion please know the city can be quite congested. It is better to go with a guide. You don’t necessarily need an excursion in Israel, but you are missing out on a lot of interesting information if you go without information. Make sure to bring a guide or book along. 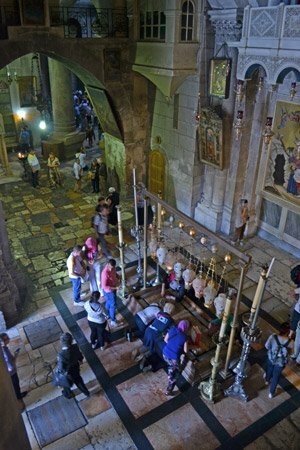 Church of the Holy Sepulchre: Church of the Holy Sepulchre is one of the most important locations in Jerusalem. This church is build over what is thought to be the place where Jesus was stripped of his garments, nailed to the cross, died on the cross and removed from the cross. Visit this sight with a guide to make sure you know what you are looking at. Wailing wall: This limestone wall is a surviving remnant of the Temple Mount in Jerusalem that was destroyed in 70 CE. It will be the eternal symbol for the Jewish faith. When you visit you can’t help to be stunned by all that is happening around you. Via Dolorosa: Via Dolorosa is “the way of suffering”. It is the path Jesus walked, carrying his cross on his way to crucifixion. Combine this walk with the Stations of the Cross to get the complete story of what happened here. The Ashdod cruise dock is located in the large port of Ashdod. 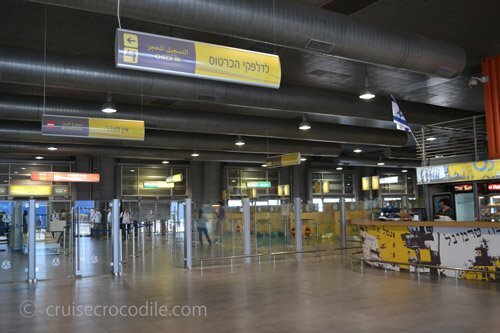 You will find a cruise terminal at the port which offers: – Check in facilities – Security check – Currency exchange – Cafeteria – Duty free shops – Taxi stand Visit our full Ashdod cruise port guide for more information about the location and facilities at the dock. The Sanctuary and Church of Nativity in Bethlehem: On this small piece of land you’ll find the Basilica of Nativity, Greek Orthodox Convent, Armenian convent and Fransiscan convent all with its own cave underneath. The Church of Nativity is the oldest church in the Holy Land and it is still in use. According to the stories it was here that baby Jesus was born in the cave that is underneath the church.